It was a difficult life for a black settler in 19th Century Upper Canada. Many came to Canada as fugitive slaves. Others came as free men and women with idealistic hopes of solidarity and acceptance by the predominantly white society. It is estimated that at its peak, the black population in Upper Canada totaled around thirty-five to forty thousand people, which made up only a small percentage of the overall population of Upper Canada. 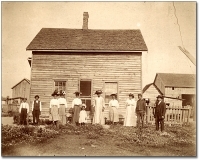 Mississauga (formerly Toronto Township in the Region of Peel) was not a place where Black settlers congregated in the early to mid-nineteenth century. In the Peel Region (which now comprises Mississauga, Brampton and Caledon) there are no records of an African Methodist Church (a sure sign of a Black community), no predominantly Black schools, and no established Black communities. 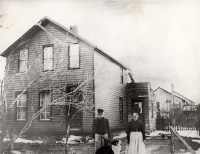 Although Black settlement was sparse within historic Mississauga, some families and individuals did settle here in the mid-1800s. Likely the distance from the American border and relative geographic obscurity were incentives. Research has shown that most Black settlers left this area by the end of the 19th Century. With both Oakville and Toronto nearby, which had established Black communities, historic Mississauga may not have kept families here very long. But who were some of the early Black settlers who chose to make historic Mississauga (Toronto Township) their home, even if for a short time? They left very little proof of their existence in the way of tangible records or documents. Through census records, council records, birth, death and marriage certificates, we have tried to piece together a depiction of the lives of individual people. Heritage Mississauga undertook a comprehensive research study in 2006 and 2007, led by Erin Brubacher, and many of her findings and articles are presented in the links below. One thing is lacking: we did not locate any pictures specific to early Black settlement in historic Mississauga – and we hope that those of you who may read this will help us shed some light and share pictures from this important chapter of Mississauga’s story. For more information on early Black History in Ontario, please contact the Ontario Black History Society at www.blackhistorysociety.ca, the Archives of Ontario at www.archives.gov.on.ca/english/on-line-exhibits/index-black-history.aspx, the Buxton Museum at www.buxtonmuseum.com, the Oakville Museum at Erchless Estate at www.oakvillemuseum.ca, and Uncle Tom’s Cabin Historic Site at www.uncletomscabin.org, amongst many other sources of information. Please share your information relating to Black settlement history in Toronto Township (historic Mississauga) and Peel County with us!